I want to believe in a "progressive majority". I really do. If we take both Labour and the Lib Dems as 'progressive', then there is a clear progressive majority in terms of votes, and also a slender progressive majority in terms of seats  provided you include additionally most or all of the SNP, the SDLP, Plaid Cymru, the Alliance Party and (of course) the Green Party. All these parties combined would deliver 329 seats. But there are very serious problems. One is that both Labour and the Lib Dems are wounded. Labour, for getting only 150,000 more votes than Michael Foot; the Lib Dems for losing five seats and not getting the vote-surge that everyone was expecting. This makes it hard to feel any momentum behind the possibility of a Lib/Lab or a broader rainbow 'coalition' (and it is the latter, with the immense complexities it would bring, that would be required in order to marshal an actual majority). If, in light of Gordon Brown's offer of real electoral reform, Nick Clegg does decide to talk to Labour as well, the arithmetic requires negotiators will have to address what to do with some or all of the Alliance, the SDLP, the SNP, Plaid Cymru, and the Greens. Which brings me to my question: How should and how will my Party, the Green Party, react? The answer is pretty clear. Our Leader and first Member of Parliament Caroline Lucas said it herself in her first interview with Jeremy Paxman, just after being elected. The Green Party will not enter into any coalition. If we were to be involved in any way with a rainbow government of the progressive majority, it would be on the basis of some kind of far more conservative 'Co-operation Agreement' (See http://findarticles.com/p/news-articles/green-pages/mi_8125/is_20070701/scottish-greens-support-minority-government/ai_n50686682/ ), as has taken place in recent years between Green MSPs and the SNP minority government in Scotland. In such a circumstance, the Green Party would focus on ensuring that some of our core issues  such as green investment (rather than cuts) as the answer to the ongoing risk of a Depression, and major constitutional and political reform (including proportional representation)  were taken seriously by such a government. Cleverly, Alex Salmond has already publicly called for something like this: http://news.bbc.co.uk/1/hi/uk_politics/election_2010/scotland/8669883.stm . He is ready to enter into the same kind of arrangement in Westminster with Labour and the LibDems as the Green Party already has with him in Holyrood. The Green Party in my opinion should make a similar call. As outlined above, Labour and the Lib Dems alone don't have the numbers, momentum, or legitimacy. By contrast, the entry of the Green Party (and the Alliance Party) into Westminster provides, in a small but nevertheless significant way, a sign of life. Our addition is something healthy and new, and a basis on which to face down the Tories and the Unionists and say that they do not represent an insurgent majority. A rainbow progressive majority administration  presumably a Lib-Lab coalition, with a 'Co-operation Agreement' arrangement with the Nationalist Parties and the Greens  might just work. It is, I believe, our best option at this time. Note that a 'Co-operation Agreement' does not, as some 'Confidence and Supply' deals around the world have done, contain any cast-iron commitment on future confidence votes, nor on future budgets. (Of course, such commitments can never really be 'cast-iron' in any case, because the deal itself can always be abrograted.) It would some kind of 'Co-operation Agreement' which I think would be most likely to work with the Green Party (and the Nats). This, as Caroline said in her first interview on election night, with the BBC, allows one to take issues on a case by case basis, but nevertheless provides a general expectation of governmental stability, under the framework of the Agreement. Rupert, as I have been saying elsewhere, Caroline's priority must be Brighton Pavilion and the voters there. She would be wise to take a back seat at this stage. She has called on Nick Clegg not to back down on PR but, ultimately, she has to serve her constituents first. The "progressive majority" talk is a con. Progressive politics goes beyond being anti-Tory, something we should not forget. Everyone knows where we are on PR but, for the moment, let the talkers talk nd let's see who loses the most. I think that the people of Brighton Pavilion voted for Caroline not just to keep the Tories out, but because they wanted a hopeful alternative to the mainstream parties. i.e. Labour and the Lib dems. Caroline is in a fantastic position where she can criticise openly all the mainstream parties for colluding to a cuts based agenda and for getting their spending priorities wrong. In fact, this is why she is such a popular candidate. Any agreement with- quite frankly- what are far from progressive parties would be a let down. But off course she should support PR- this doesn't mean siding with any parties at all. It won't work Rupert, there are still some very tribal Labour MPs who will oppose PR. Nationalist will make unreasonable pork-barrel demands. Unless Caroline Lucas agrees to be formally part of the coalition, why should others take the risk. A chaotic end to a progressive coalition would lead to a fresh general election where the Tories would get a majority on a minority vote. A rainbow coalition would be disasterous for all participants. It will be smashed when economic conditions deteriorate - as they will. This will probably be before PR legislation can be passed. The Tories will then sweep to power with a large majority. Yes, there is a risk that a Conservative / Lib Dem arrangement might work, but I'd say that's odds against. You all make good points - but I put it to you that you lack enough hope, and enough ambition. I have answered some of your points already, recently, elsewhere on this blog. 'Confidence and Supply', or even a weaker arrangement such as the 'Co-operation Agreement' that the Greens have with the SNP in Scotland, can be perfectly stable. As the Holyrood experience of the last 3 years proves. 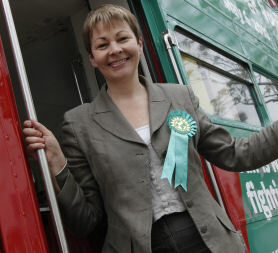 As Caroline tweeted today: "@CarolineLucas happy to consider confidence/supply w/ reform-oriented coalition". That's as it should be. The Green Party absolutely does not have enough in common with the old growthist Parties to join them in formal coalition. But stopping Tory cuts, and gaining PR: that would be a 'Yes' to a #progressivemajority arrangement of some kind. The arithmetic is very tight. We should help it, not stand in its way. IT WAS THE SUN WOT HUNG IT? So, what happened in NorwichSouth? 1. 2. 3. Rupert's Read: How the Green Party can help stop the Tories 4. 12. 15. 16. 17. 18. 19. 25. 26. How the Green Party can help stop the Tories 27. 28.